Mouse anti Human desmoglein-3 antibody, clone 5G11 (MCA2273) used for the evaluation of desmoglein-3 expression on human cells by immunofluorescence. 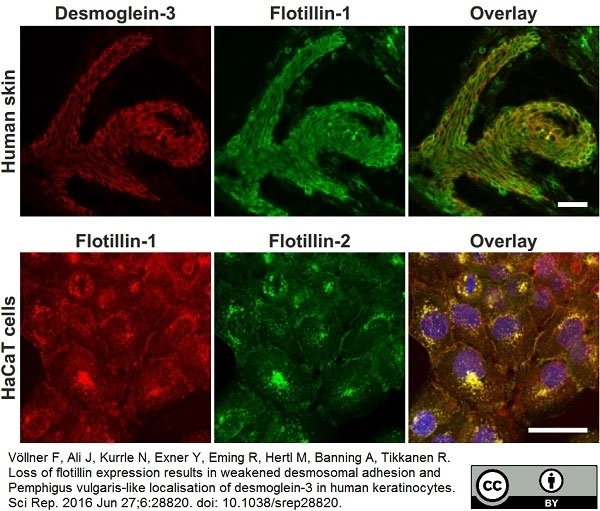 Desmoglein-3 and flotillin-2 colocalise in human epidermis and human epithelial cell lines. Human skin cryosections, HaCaT and MCF10A cells were immunostained for Dsg3 (red) and flotillin-2 (green). In human epidermis, flotillin-2 is expressed throughout the epidermal layer and colocalises with Dsg3 in keratinocytes of the stratum basale and suprabasale. In HaCaT keratinocytes, flotillin-2 is localised at the cell membrane and in intracellular vesicular structures. Dsg3 is localised at the plasma membrane where it colocalises with flotillin-2. 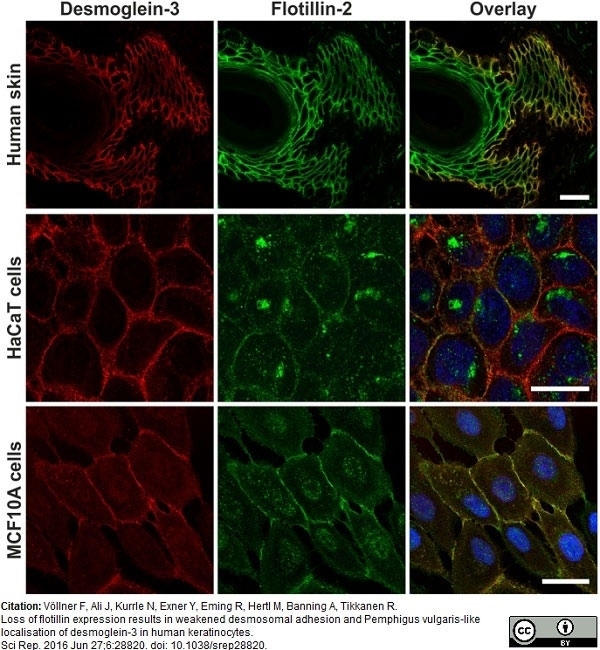 In MCF10A mammary epithelial cells, flotillin-2 and Dsg3 show a more profound colocalisation at the sites of cell-cell contact. The cell lines were grown on glass coverslips for at least 3 days. Scale bar: 20μm. 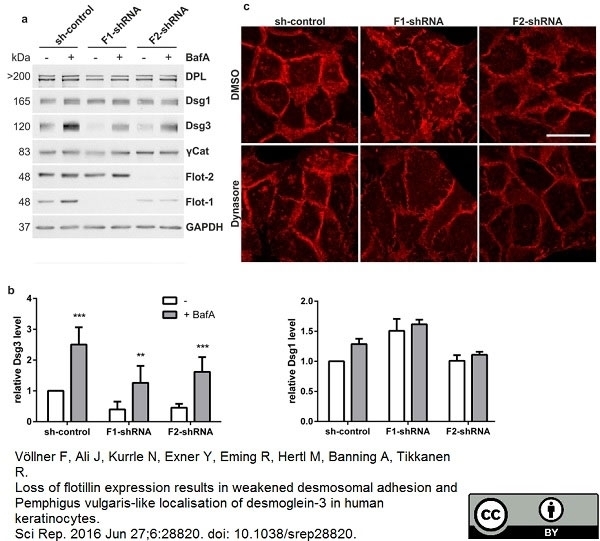 From: Völlner F, Ali J, Kurrle N, Exner Y, Eming R, Hertl M, Banning A, Tikkanen R.
Loss of flotillin expression results in weakened desmosomal adhesion and Pemphigus vulgaris-like localisation of desmoglein-3 in human keratinocytes. Sci Rep. 2016 Jun 27;6:28820. Mouse anti Human desmoglein-3 antibody, clone 5G11 (MCA2273) used for the evaluation of desmoglein-3 expression on HaCaT cells by immunofluorescence. Loss of flotillins results in pemphigus vulgaris like localisation of Dsg3 in HaCaT keratinocytes. (a) HaCaT cells depleted of flotillin-1 (F1-shRNA), flotillin-2 (F2-shRNA) or control shRNA cells (sh-control) were grown for three days on glass coverslips, fixed and stained with Dsg3 (red) and flotillin-2 (green) antibodies. Note that the signals for Dsg3 in flotillin knockdown cells in (a) have been adjusted to make the morphological deficiencies more clear. (b) HaCaT keratinocytes were grown for two days on glass coverslips and treated with 150 μg/ml of either control-IgG (healthy person) or IgG from PV patients for 20 h. Cells were fixed and immunostained for Dsg3 (red) and flotillin-2 (green). Scale bar: 20 μm. (c) Quantification of flotillin-2 localisation in control IgG vs. PV IgG treated cells. 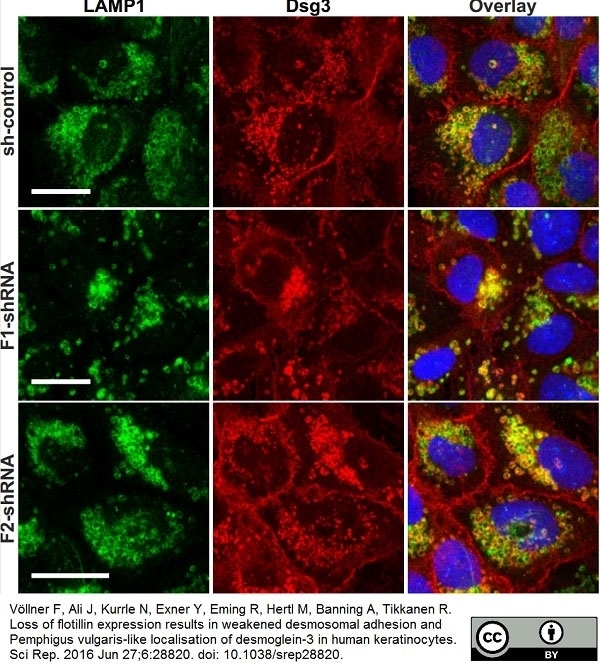 At least 8 images/condition (total of >200 cells/condition) originating from three independent experiments were quantified for plasma membrane associated vs. intracellular flotillin-2 staining. Statistical analysis was done by Student's t test (***p <0.001). Mouse anti Human desmoglein-3 antibody, clone 5G11 (MCA2273) used for the evaluation of desmoglein-3 expression on HaCaT cells by western blotting. 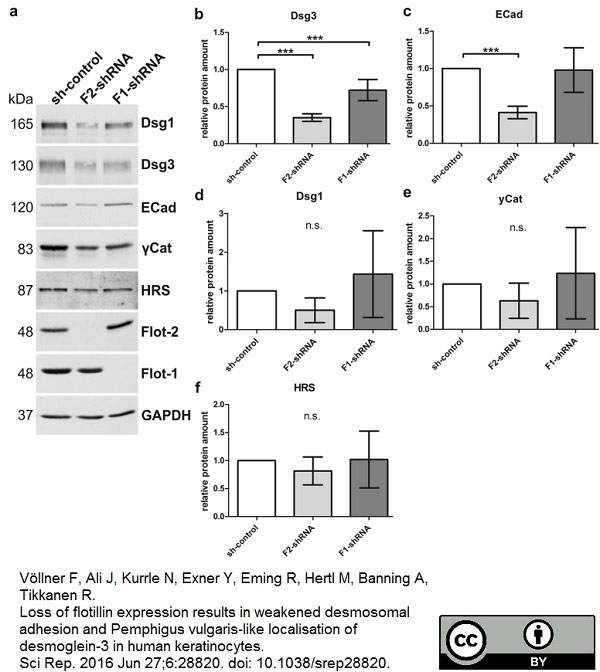 Flotillin depletion results in diminished Dsg3 and E-cadherin protein levels in HaCaT cells. (a) HaCaT cells with a stable flotillin knockdown or control cells were grown until confluent, and equal protein amounts were analysed by Western blot. (b–f) Western blot signals were quantified by scanning densitometry and normalised against GAPDH. Bars represent the mean ± SD of five (b–e) or four (f) independent experiments. One-way ANOVA with Bonferroni's multiple comparison test. ***p <0.001. Flotillin knockdown weakens the adhesion strength in HaCaT keratinocytes but does not affect the raft association or detergent solubility of Dsg1 and Dsg3. (a) HaCaT cells depleted of flotillin-1 (F1-shRNA) and flotillin-2 (F2-shRNA) and control shRNA cells (sh-control) were dissociated from the plate with dispase and the monolayers were mechanically disrupted. Fragments were fixed, stained and imaged. (b) Relative fragment number from six independent experiments. Bars represent the mean ± SD. One-way ANOVA with Bonferroni's multiple comparison test. *p <0,05, **p <0,01, ***p <0.001. (c–e) Rafts were isolated from control shRNA (c) and flotillin-1 (d) or flotillin-2 (e) depleted HaCaT cells using detergent extraction and density gradient centrifugation. Nine fractions were collected from the top of the gradient (fraction 1 = the lightest fraction) to the bottom and analysed by Western blot. (f) Sequential detergent extraction of HaCaT control and flotillin knockdown cells. Cells were initially extracted with a Triton X-100 buffer followed by solubilisation of the Triton X-100 insoluble proteins with an SDS/urea buffer. Equal volumes of extracted proteins were analysed by Western blot. Please note that the total volume of the insoluble pool is twice that of the soluble one. The lysates shown in the last three rows were extracted with a NP-40 containing lysis buffer to facilitate solubilisation. Mouse anti Human desmoglein-3 antibody, clone 5G11 (MCA2273) used for the evaluation of desmoglein-3 expression on HaCaT cells by western blotting and immunofluorescence. Inhibition of lysosomal degradation or endocytosis restores Dsg3 level and improves desmosomal morphology in flotillin knockdown cells. (a) Flotillin depleted or control HaCaT cells were treated for 24 h with BafA (50 nM) to block lysosomal degradation. Cell lysates were analysed by Western blot. (b) Western blot signals for Dsg3 (upper) and Dsg1 (lower) were quantified by scanning densitometry and normalised against GAPDH. Bars represent the mean ± SD of 6 independent experiments. Two-way ANOVA. *p <0,05, **p <0,01, ***p <0.001. (c) Flotillin knockdown or control cells were serum-starved overnight and treated for two hours with 80 μM Dynasore to inhibit dynamin-dependent endocytic uptake of Dsg3 from the plasma membrane. DMSO served as a control. Cells were fixed and immunostained for Dsg3. Scale bar: 20 μm. Mouse anti Human desmoglein-3 antibody, clone 5G11 (MCA2273) used for the evaluation of desmoglein-3 expression on human skin cryosections by immunofluorescence. Desmoglein-3 and flotillin-1 colocalise in human epidermis. Human skin cryosections were immunostained for Dsg3 (red) and flotillin-1 (green). In human epidermis, flotillin-1 is expressed throughout the epidermal layer and colocalises with Dsg3 in keratinocytes of the stratum basale and suprabasale. In HaCaT keratinocytes, flotillin-1 and flotillin-2 extensively colocalise at the cell membrane and in intracellular vesicular structures. Inhibition of lysosomal degradation or endocytosis doesnot change desmoplakin and γ-catenin levels but results in lysosomal accumulation of Dsg3 in flotillin knockdown cells. Mouse anti Human Desmoglein 3 antibody, clone 5G11 recognizes human desmoglein-3, also known as 130 kDa pemphigus vulgaris antigen or Cadherin family member 6. Desmoglein-3 is a 999 amino acid ~125 kDa single pass type I transmembrane glycoprotein, a core component of the desmosome cell-cell junction between epithelial cells. Desmoglein-3 is synthesized in the basal and lower suprabasal layers of the skin. Mouse anti Human Desmoglein 3 antibody, clone 5G11 does not recognise desmoglein-1 or desmoglein-2. 1This product requires protein digestion pre-treatment of paraffin sections e.g. pepsin (See Wu et al). Alternatively it is reported that staining of FFPE material may be enhanced using protein digestion with e.g. pronase, followed by HIER in citrate buffer. Wu, H/ et al. (2000) Protection against pemphigus foliaceus by desmoglein 3 in neonates. N Engl J Med. 343 (1): 31-5. Wan, H. et al. (2007) Increased keratinocyte proliferation initiated through downregulation of desmoplakin by RNA interference. Exp Cell Res. 313: 2336-44. Szegedi, A. et al. 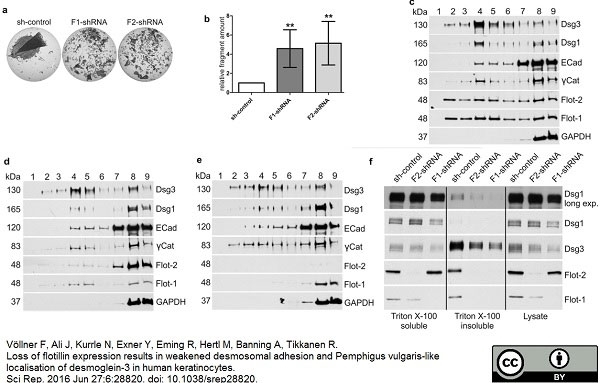 (2008) Protein kinase C isoenzymes differentially regulate the differentiation-dependent expression of adhesion molecules in human epidermal keratinocytes. O'Shea, C. et al. (2014) Desmosomal defects in acantholytic squamous cell carcinomas. J Cutan Pathol. 41 (11): 873-9. Völlner, F. et al. 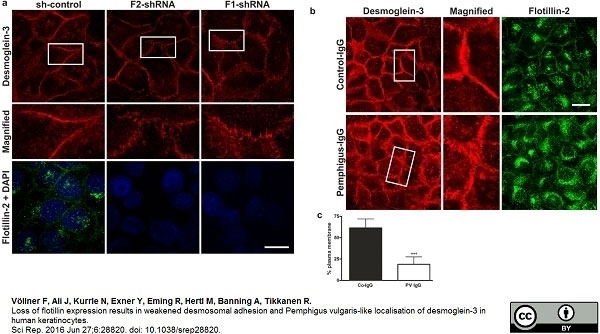 (2016) Loss of flotillin expression results in weakened desmosomal adhesion and Pemphigus vulgaris-like localisation of desmoglein-3 in human keratinocytes. Koch, P.J. et al. (1998) Desmoglein 3 anchors telogen hair in the follicle. J Cell Sci. 111 ( Pt 17): 2529-37. Jolly, P.S. et al. (2010) p38MAPK signaling and desmoglein-3 internalization are linked events in pemphigus acantholysis. J Biol Chem. 285: 8936-41.